The city of Maharashtra comes together to celebrate Gudi Padwa on the 7th of April. This festival finds its name with a holy symbolic flag they hoist which is also called gudi. The day is celebrated on the first day of the Chaitra month and marks the beginning of the New year according to the lunisolar Hindu calendar. The new year festival is majorly celebrated in the Konkan area of Maharashtra and the celebration sees families come together, decorate the house, place the auspicious gudi and wear new clothes and prepare mind-blowing Maharashtrian foods, especially Puran polis. In Karnataka and Andhra Pradesh, the festival is celebrated as Ugadi or Yugadi whereas the Sindhi community celebrates the day as Cheti Chand. Also popularly known as the Maharashtrian New Year, the day calls for some mouth-watering food items made in a Maharashtrian. What are festivals in India without the feast first of all? 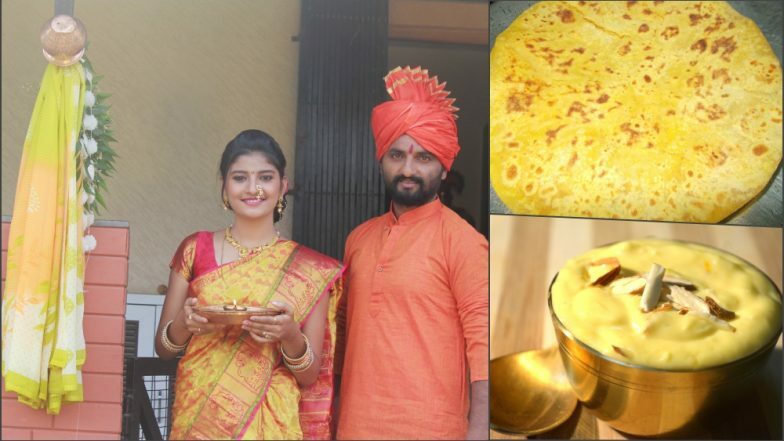 Ugadi 2019: From Obbattu to Ugadi Pachadi Here Are Traditional Recipes From Andhra Pradesh, Telangana and Karnataka to Celebrate New Year. Kesar Elaichi Shrikhand is traditional sweet that Maharashtrians enjoy all time of the year, however, it finds a special place on the thali on Gudi Padwa. Gudi padwa is almost incomplete without this sweet treat for your taste buds. Made out of split dal and flour, this sweet food can be easily made and tastes magical. Looks like Maharashtrians love to eat sweets. Another sweet dish that almost looks like halwa and taste amazing. It is made from broken wheat and holds important significance of being auspicious. Made from colocasia leaves this traditional Maharashtrian dish is a savoury-sweet treat that can be either boiled or fried. This traditional recipe requires some real skills to make but isn't really that difficult. Maharashtrians usually make it on the occasion of Gudi Padwa. Let's say Naveen Varsha chya Hardik Subhecha to all in the tastiest way this Gudi Padwa! Make these easy recipes at home and learn more about the rich food tradition of Maharashtra.